Download our Latest Articles, White Papers and Research. The flipped classroom – sometimes called flipped training – inverts traditional training methodologies, delivering the bulk of instruction online outside of the classroom and moving application inside the classroom. Download this article and learn how computer‐based business simulations fit seamlessly into this new model as powerful tools for building skills through action learning and facilitation. 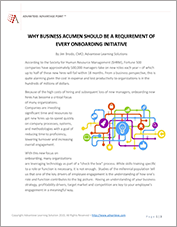 Advantexe's Why Business Acumen Should be a Part of Every Onboarding Program article discusses the importance of adding business acumen training as part of an onboarding process so that new hires can better understandtheir role and how their decisions help or hurt the execution of your company's strategy. Arming high potential and future leaders with the business leadership skills they need to fill the shoes of departing managers and executives is a key element of a successful transition. 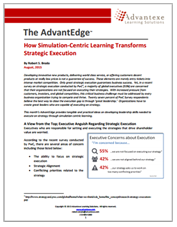 This Advantexe article takes a deep look at the role of simulation-centric business acumen learning in leadership development. Business simulations are growing in popularity as valuable learning tools in corporate talent development engagements. In this Advantexe article learn how Best-in-class companies are investing significant resources in identifying how engaged their employees are, what areas they need to work on, and how they can increase engagement to create a stronger, more aligned workforce. Only great strategic execution guarantees business success. Yet, in a recent survey on strategic execution conducted by PwC , a majority of global executives (55%) are concerned that their organizations are not focused on executing their strategies. In this issue of the AdvantEdge we provide you with tangible and practical ideas on developing leadership skills needed to execute strategy. Interesting new research data shows that a certain customer type is attracted to new products that will fail in their market. In this article you will learn how developing business acumen and business leadership skills to helps managers understand what drives the Harbinger of Failure business concept and how they can be the difference between organizational success and failure.